For photographers, nothing shows off your session or event better than having the entire sessions’ images in hand. 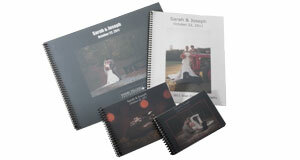 Use our Spiral Bound Photo Proof Books as an add-on or incentive in your packages. Our proof books are printed on Kodak Endura Lustre surface photographic paper and spiral bound with a custom front and frosted cover and black backing to protect your prints. We offer several sizes, configurations and a choice of white or black backgrounds. Spiral bound proof books are vailable through our ROESpro software. Spiral bound with a frosted front cover and solid black back for protecting your images. What is the turnaround time for Proof Books? Proof Books have a two business day turnaround in house based on a receipt of your order by 9 am EST. Receipt after 9 am EST will put your order into the next business day’s production que. What kind of paper are proof books printed with? Proof books are printed on Kodak Endura Lustre surface photographic paper using a silver halide process. They are not inkjet prints. Do I have to have the spiral binding? No, upon check out, you can select to have your proof pages bound or left unbound. Binding is $5.00.